Document Navigator in View view displays the content archive tree hierarchy with content items (such as documents and images) linked to Content Types. The SureClinical Desktop client provides different ways to sort these documents. It allows displaying documents in the content archive tree according to a selected viewing option. By Organization Role: The hierarchy tree folders are organized by Organization roles (the role of the organization, which is responsible for or linked to a document). Each folder represents an Organization role and includes sub-folders representing organizations with these roles. Each Organization folder includes a hierarchy of sub-folders representing Categories, Sub-Categories, and Content Types that include documents for Organizations with this Organization role. By Organization: The hierarchy tree folders are organized by Organizations defined in each clinical study. Each folder represents an Organization and includes a hierarchy of sub-folders representing Categories, Sub-Categories, and Content Types that include documents for this Organization. By Person Role: The hierarchy tree folders are organized by Person roles (the role of the person who is responsible for or linked to a document). Each folder represents a Person Role and includes Persons (by Person Name) with this role. Each Person folder representing includes a hierarchy of sub-folders representing Categories, Sub-Categories, and Content Types that include documents for Persons with this Person role. By Person: The hierarchy tree folders are organized by Persons (Person Name) defined in Organization within each clinical study. Each folder represents a Person and includes a hierarchy of sub-folders representing Categories, Sub-Categories, and Content Types that include documents for this Person. By Study Site: The hierarchy tree folders are organized by Study Sites (the folder name format is Site ID - Organization name). Each Study Site folder includes sub-folders for Classification Categories and Content types linked to documents related to these study sites. By Study Site Country: The hierarchy tree folders are organized by countries. Each Country folder includes study sites in this country, where each study site folder includes classification folders with documents linked to these study sites. By Study Subject and Visit Number: The hierarchy tree folders are organized by Study Sites. Each folder represents a Study Site and includes sub-folders representing Study Subjects (identified by their Subject Identifiers). Each Subject Identifier folder includes sub-folders for Study Subject's Visit Number. Each folder representing a Visit Number includes sub-folders for Classification Categories and Content Types along with their linked documents. By Forms: This view displays forms linked to different Content Types. My Tasks: This view shows different active tasks assigned to you and tasks you have completed. Tasks are categorized by their Workflow Process templates. My Reports:The hierarchy tree folders are organized by different types of generated reports. Please refer to Reports menu for more information about reports that can be generated. My Bookmarks: This view shows the list of bookmarks for a user. Each bookmark includes a group of documents. The hierarchy tree is organized by names of bookmarks. My Search: This view shows search results for Advanced Search in addition to saved search results. 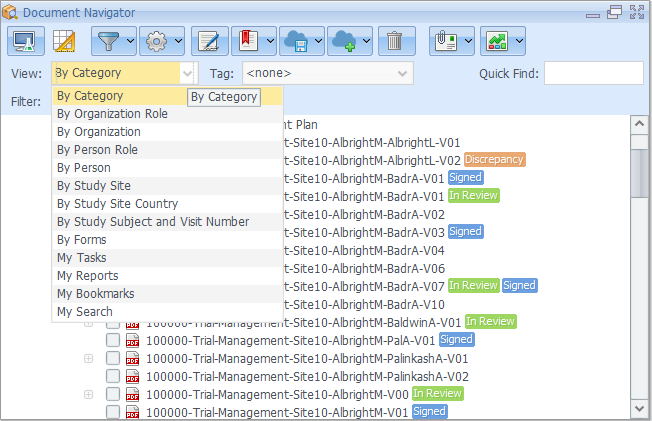 The hierarchy tree folders are organized as those in the view option By Category. However, this view option displays only Content Types for documents found in the search process.